Manufacturers Index - Hobbs, Gordon & Co. This busines was founded in about 1880 by Horatio Hobbs and Edward F. Gordon. Gordon was a well-known woodworking machinery designer who apparently continued to work at John A. White Co. even after found his own business. Hobbs, Gordon & Co. specialized primarily in steam-heating equipment: steam boilers, radiators, and valves. But they also manufactured tablesaws and radial drills. Gordon had received an 1874 patent for a bandsaw which was manufactured by D. C. Allen & Co. of Concord. He later worked for Concord (N. H.) Machine Co., which was became part of John A. White Co.; an 1892 Manufacturer & Builder article reported that Gordon was moving to Dover as part of the buyout. 1884 ad in "The Bay State Monthly" that describes them as "manufacturers of boilers and radiators, saw benches and suspended full swing radial drills." An 1885 in the same journal shows the "Concord suspended radial drill", and "full swing drill," and another ad lists the "H. G. saw-bench." SHEET IRON RADIATORS AND RAPID CIRCULATING TUBE BOILERS. 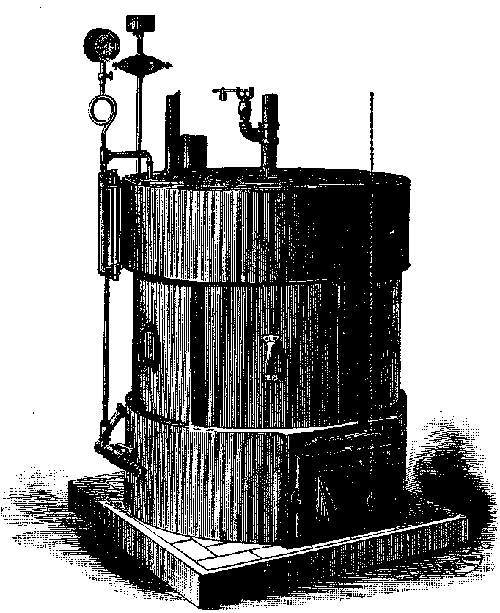 Patented May 11, 1880.—R. Oct. 21, 1882.—V. Jan. 30, 1883.—R. Jan. 30, 1883.—B. The March 1885 issue of Bay State Monthly , transcribed by the Gutenberg Project, included an ad for "HOBBS, GORDON & CO.'S / Concord Suspended Radial Drill, / [Illustration]/ AND FULL SWING DRILL. / CONCORD, N.H."
The November 1885 issue of Bay State Monthly , transcribed by the Gutenberg Project, included an ad for"[Illustration] / ECONOMIST SUMMER COOK STOVE / IS SAFE, ODORLESS, CLEANER, EASIER TO CONTROL, GIVES LESS HEAT IN / ROOM, & IS CHEAPER TO RUN THAN ANY OIL, GAS, OR GASOLINE STOVE MADE. / BURNS COAL, WOOD, OR COKE. / SEND FOR CIRCULARS. / MADE ONLY BY HOBBS, GORDON & CO. CONCORD, N.H. Price $16." An 1892 article in Manufacturer & Builder announced the acquisition of John A. White Co. by Dover Machine Works.